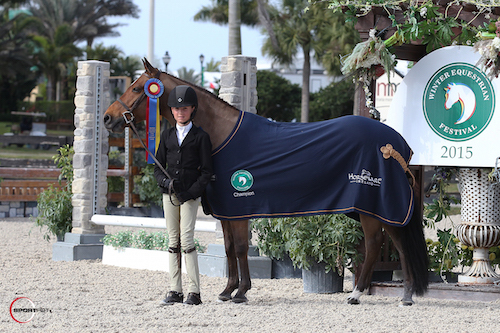 On the final day of competition for WEF 7, Natalie Jayne, from Elgin, IL, rode Daisy Farish's pony, Cleverist, to championship honors in the Medium Pony Hunters. The pair won the two over fences classes on Saturday, as well as the first over fences class on Sunday and the under saddle. "Cleverist has been going great, and today the courses rode really nicely," trainer Patricia Griffith explained. Emma Kurtz piloted GC Ponies' entry, Elegance, to the reserve championship prize. Elegance earned two seconds and two thirds over fences over the two days of competition. Jayne started riding Cleverist in September, but did not make their show ring debut until the beginning of the WEF circuit. "She [Jayne] is still getting to know him [Cleverist], and this week she was able to put all the rounds together," remarked Griffith after the championship presentation. Cleverist not only shines in the hunters, but is also used in the equitation. "I showed him in the WIHS Pony Equitation and USEF Pony Medal this week, and he was first and second. He was also first and second the first week of WEF," Jayne explained. "He really likes other ponies, and he is very friendly. He also licks people when he is looking for treats," Jayne smiled as she talked about her pony. Along with Cleverist, Jayne shows two other ponies in the hunters. Completely dedicated to riding at the age of 11, Jayne lives in Florida during the winter months in order to keep up with the demanding schedule. Already off to a successful 2015 show season, Jayne is looking forward to the remainder of the show season and hopes to qualify for indoor finals in the fall. The 2015 Winter Equestrian Festival continues with its eighth week, featuring CSIO 4* competition, on February 25-March 1. Week 8 highlights the $34,000 Ruby et Violette WEF Challenge Cup Round 8 on Thursday, the $100,000 Nations Cup presented by Kingsland Equestrian on Friday, the $25,000 Nutrena Jumper Classic and Hollow Creek Farm Children's, Junior and Young Rider Nations Cup classes on Saturday, and the $25,000 Suncast® 1.50m Championship Jumper Classic and $150,000 Grand Prix CSIO 4* presented by Lugano Diamonds on Sunday. For full results and more information, please visit www.pbiec.com. us.sportfot.com. These photos may be used only in relation to this press release and must include photo credit.